All Fellows – accompanied by their school leaders – will convene to share experiences and discuss relevant issues and concerns. Fellows will also be expected to work with colleagues and school administrators to carry out post-fellowship plans, and submit a report on the impact of the fellowship. Here are some examples of presentations from the NATF Convening 2015! Click here! Here are some examples of presentations from the NATF Convening 2014! Click here to view the presentation of 2014 Fellow Paul Ferraris, set in Mexico! Click here to view the presentation of 2014 Fellow Cava Menzies, set in New Orleans! You can view the 2014 NATF Convening presentations here! Here are some examples of presentations from the NATF Convening 2013! You can view the rest of the 2013 NATF presentations here! For the National Artist Teacher Fellowship up to twenty awards of $5,500 each will be made, with a complementary grant of $1,500 to the Fellow’s school to support post-fellowship activities. Below are examples of some post fellowship projects by NATF fellows. Click on each Fellow to view their project. For his post fellowship project, Ed Glassman had his students write scripts, design puppet characters, create puppets, create scenery, and videotape their shows using a green screen. He finish by having the students video edit and add sound effects and music to their projects. The movies were shown in December and May at thier moviemaking department film festival. For her post fellowship project, Cynthia Sutton hosted a mini-songwriting festival for young (15 – 21) songwriters, in conjunction with the Idaho Songwriters Association. There were 18-24 student participants from all over the Treasure Valley, and three songwriter tutors. Each student participating attended the Festival on Friday evening from 4:00 – 8:00, and then the next day from 10:00 am to 8:00 pm. The festival culminated in a performance at 8:00 at the Flying M, with each participant performing the song which he or she had written that weekend. After her experience with Directors Lab North for her Fellowship, Lois Hunter designed a post fellowship project that incorporated new techniques she learned which had an immediate impact on her approach to teaching and directing. She used the funds to mount a production of Departures and Arrivals by one of Canada’s foremost playwrights Carol Shields. Lois cast seventy-two (72) young actors in the play and used the funds to support the technical production costs, including the set, props, costumes, musicians, lighting and makeup expenditures. Tanya Bennett’s post fellowship project exposed her music students to improvisation techniques she learned on her fellowship. To facilitate this, she purchased an electric violin, a five string electric violin, two amplifiers and more non-traditional music. She also used the funding to help purchase an electric cello. Students performed using these instruments at the WAPA Concert on December 13, 2013 at the Music Hall in Detroit, MI with guest artist Quincy Jones. To learn more about Ms. Bennett and her experience with NATF, Click Here! By purchasing this equipment I believe that the students will be inspired to continue to grow as young artists who will dream of new ways to use their string instrument! I will continue to teach them classical music but I must give them an opportunity to grow as overall musicians and by having electric instruments available to them I look forward to providing them with opportunities to grow to become more versatile! 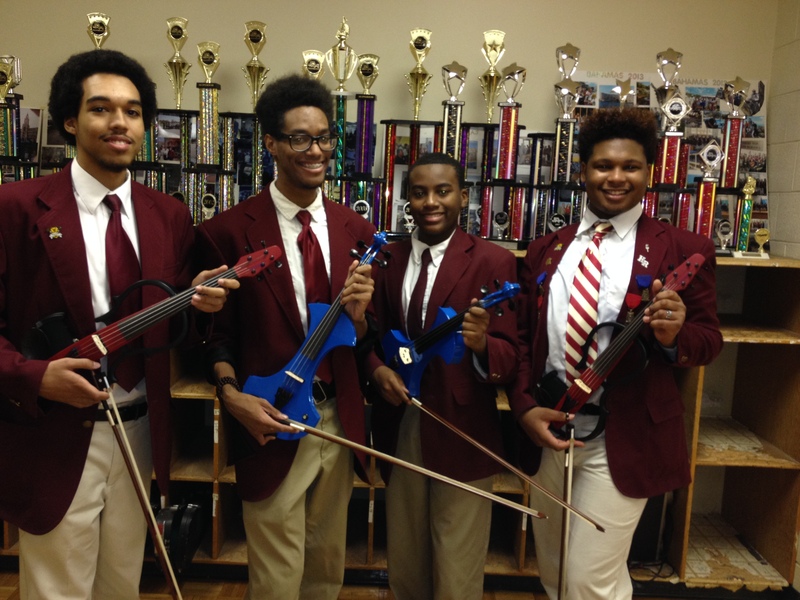 Winans Academy students with their Electric Violins acquired through the NATF post fellowship funds!